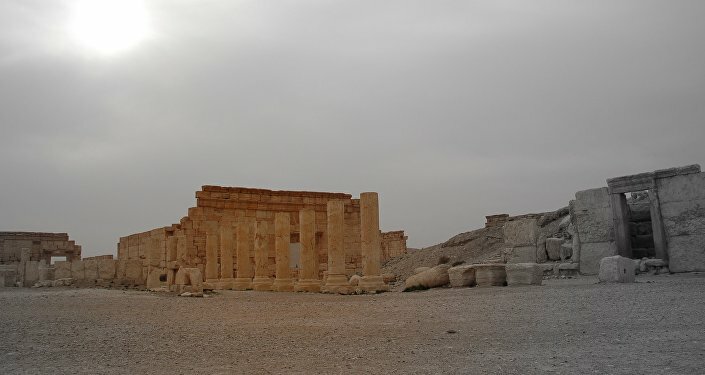 A Russian military spokesman dismissed earlier reports that Russian warplanes had bombed the ancient city of Palmyra, as was claimed by several international media outlets. Russian warplanes destroyed an ISIL command center on the outskirts of Syria's Palmyra, killing up to 40 militants, a Syrian military source told Sputnik on Tuesday. The command center was located near the town of As Sukhnah 28 km away from Palmyra. “The surgical airstrike was carried out in the vicinity of As Sukhnah. An ISIL command center was destroyed along with several pickup trucks and armored vehicles that were parked nearby. Thirty-five to forty militants were killed,” he added. Earlier on Tuesday, Western media outlets cited Syrian state television as reporting that Russian fighter jets had struck Islamic State militant targets among the ancient ruins of Palmyra, a 2,000-year-old city and registered UNESCO site. "All reports by foreign media that Russian planes allegedly conducted airstrikes against the city of Palmyra are an absolute lie," ministry's spokesman Maj. Gen. Igor Konashenkov said in a statement.